Hobie Forums • View topic - Camping, ever Tow a supply yak behind an AI? Camping, ever Tow a supply yak behind an AI? Post subject: Camping, ever Tow a supply yak behind an AI? Thinking of doing a camping adventures that I tow a smaller yak behind to hold all or most supplies/gear. Anyone have experience, what are the pros/cons, what's a good yak that can work, where/how would you connect? Post subject: Re: Camping, ever Tow a supply yak behind an AI? Is there any particular reason why you need to do this fisherman-rd ? How long do you expecting to go for ? Most of us can go out for a week and carry all gear necessary. You just needs a bit more planning with food preparation and water conservation. And that’s with an AI. With a TI you’d kill it. fishman-rd, please read the recent Watertribe Everglades Challenge thread, and then consider. The AI can be made to work. Slaughter and many others will back this up. I'm not so sure the TI has a whole lot more useful stowage space though. If 2 guys are going, it's pretty tight. I'm with the others who have responded. I wouldn't take an extra tow behind kayak. It's not something that you should need. You're far better off to look at what gear you're looking to take, and perhaps find a better selection of products. For instance, I have a camp stove that fits inside of a tiny bowl, so you can leave the big campstove at home. Good thermarest mattresses provide plenty of sleeping padding and warmth for a kayak trip, and pack up quite small. There are a lot of great food options that just require adding boiled water, and you don't even need a bowl for some of them, you can pour the boiling water right into the package. Towing behind another kayak creates all kinds of problems. In wind, the boat won't sit directly behind you, it will be blown sideways. Waves cause all kinds of problems for kayaks without users. Most kayaks are designed to have some stability by having an active user, (someone who will lean and move naturally to find the centre of gravity). Sticking your gear in a separate boat means that you can't rearrange things or hold on to things. Even a simple motorboat passing can throw unexpected waves into the equation and create problems. All of the questions that you ask are problems that would have to be dealt with. Finding the right kayak (depends on many factors, including conditions) Where and how would you connect? The AI isn't designed with a tow hook, even the obvious points of connection aren't designed for the forces of towing something. Don't forget that the AI can have accessory trampolines installed in seconds. These are great places to hold gear that you don't want to bury inside the kayak. I've done multi day trips with almost no gear inside my boat. A few good large dry bags on the back of the boat, and some quick access stuff on the trampolines, and off I went. If you have the cash to spend on a second kayak, spend the money instead on finding better kayak specific camping gear. You'll eliminate a whole bunch of headaches that way and have a lot more fun on your trip! The only time I tried towing was to assist a tired friend, and I didn't enjoy the experience. I've never seen one, and I don't think I'd want one, but the concept is interesting. You could haul gobs of stuff on a SUP board - safely, for the most part. You could rent one for a couple weeks, but I wouldn't. Put some Hakas or tramps on the boat and load em up. 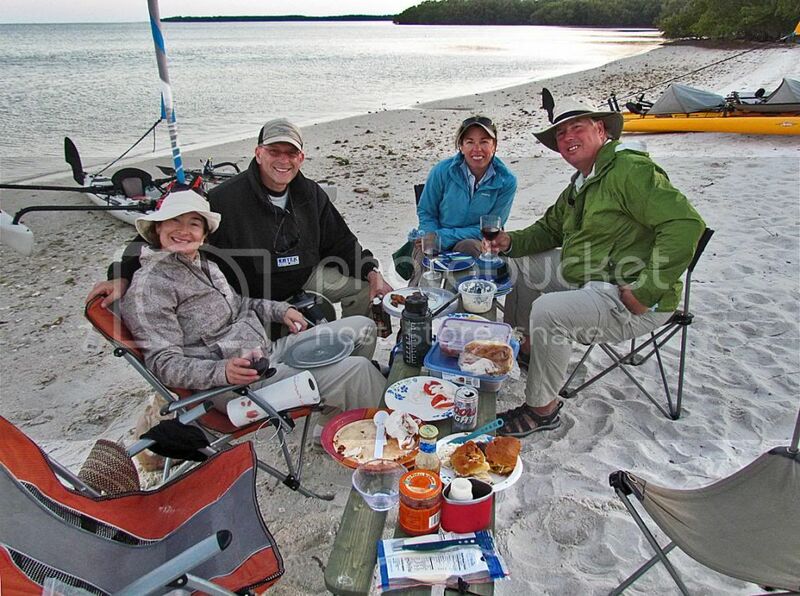 When you're camped, you can leave everything on shore as you fish. Put some extra floatation in the aft, if you can. Think this will do it for you? No problems fisherman-rd. In fact when I first started I thought the same thing. My son has a 2.4m fat-arse-sit-on kayak that I take bass fishing and that would be as good as anything for towing. But once I got in the swing of minimizing food and gear, I found that there was no point. then use the water for washing up. All the water for both these operations can be clean sea water so you don’t need to tap into your fresh water supply at all. It also saves on gas and time. If you need to boil an egg or spuds, again, use clean sea water. Or if you use fresh water to boil an egg, re-use the water for a cuppa. We should start a thread on this topic. Last edited by Slaughter on Thu Mar 07, 2013 5:42 pm, edited 1 time in total. Don't leave the beers out of the recipe, or you'll ruin everything. I'm nowhere near an ocean, so everything is freshwater around us. To continue on with Slaughter's suggestions, I pack bottled water on most of my trips, but you'd be surprised how little you end up needing if you're smart and use lake or river water as Slaughter suggests. But in addition to taking bottled water, I take a good quality water filter. They're not all that expensive now, and other than needing to stay away from salt water, they work very well. I have friends that do two week trips with nothing but a filter. Portaging with water is a pain in the rump! So depending on where you go, and if you trust your filter, you could cut water completely out of your "to pack" list. If you do that, remember to take a second filter though!! When I pack bottled water, I'll never drink the last few bottles. I always make sure that I have enough bottled water to get me home if my filter fails (breaks, gets lost etc). There are all kinds of tricks to pack light, but the AI allows you to take extras! It will have more than enough space for most if you know what to cut back on, and what to bring extra of. Slaughter - Here is the list. Help us out! You'll have to start a different thread for preserving water, cooking etc. Yeah, great comments. I would love to see this in another thread though. Then Keith could tell us, do you pack a cooler at all now? Hard or soft, to protect foodstuffs or fragile gear? Any ice, such as frozen gallon blocks? Maybe it's too tempting to have cold beverages along. Glug glug. Fresh eggs and milk are nice for the first couple days. With no showering, and all that stagnant everglades water, how do you keep from going septic? Love everyone's minimalist ideas. When I pack for a short trip I end up needing a steamer trunk! I have sailed this in quite a bit of wind and wave, with 5 people aboard (3 in the canoe) With the akas mounted near the side of the canoe as depicted here (Model 1), the canoe was tilted down a fair amount, and bow splash from the TI put quite a bit of water in the canoe (but there was crew to pump ). Subsequent models supported the akas in a holes in the middle of thwarts I added. Model 2 was too weak, with thwarts made of pine 1x4 with a big hole, and it broke in modest conditions in San Diego Bay, Model 3 is bigger, and made of oak. Has held in modest conditions. Should be plenty strong. Last edited by beebrain on Mon Mar 11, 2013 3:35 pm, edited 3 times in total. I'm not quite ready to give up a cooler, but for my solo trips (i.e., w/o my wife) I'm carrying a normal, 4 lb, 18 qt cooler (contrast with my 36 qt Xtreme cooler which weighs 11 lbs empty.) It will keep food cold for 3 days in hot weather, maybe 4-days if on the cool side here in S FL. And, the frozen bottles of water in the cooler, become drinking water near the end of the trip. I don't use fresh eggs (can't do that at my age), but I do carry a carton of "Egg Beaters"--they are not bad if you chop up some onion and a bit of low-fat cheese. 1 carton = about 3 omelets. That and an English muffin make a pretty good breakfast or even dinner. I also pre-cook rice (make about 2 servings for a 4-day trip) and pre-cook broccoli, which can be added to things--even the omelet mentioned above. The rice goes with my Tasty Bites dinner. I've never done fresh water, rinse showers--just jump in the ocean, with your clothes on, if you feel it is necessary. On my recent 4-day trip, I carried four 8 oz cans of beer in the cooler. But that doesn't look like anything like a minimalist, vegetarian, ready to mix, tasty-bite, eggbeater sandwich sitting next to your cold beer. (You are so busted). Maybe I could handle hanging with you, after all.